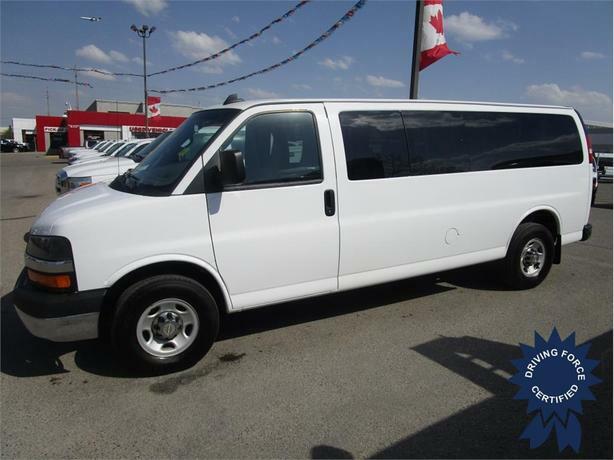 This highly optioned 2016 Chevrolet Express LT 15 Passenger Van is ready to move people. Features include remote start, backup camera, Bluetooth, easy clean vinyl floor, built-in power inverter, 6.0L Gas engine, steering wheel audio controls, OnStar, chrome grill, chrome bumpers, balance of factory GM warranty, 120 point inspection, Alberta CVIP Bus inspected, fresh service, clean CarProof history report and more. Call or email one of our fleet sales experts today and experience the DRIVING FORCE difference.